9. What Should Be Done To Resolve the Issue? How should the “comfort women” issue be resolved? To find the answer, let’s look at some of the reasons that the “comfort women” issue began receiving considerable attention in the 1990s, half a century after World War Ⅱ, and what can be said about the Japanese government’s response. Abandoned (→Introduction 6) by the Japanese military and government and suffering from PTSD caused by their traumatic experiences (→Introduction 7), former “comfort women” and women who suffered sexual violence were unable to make appeals and remained silent. Furthermore, under the cold war, authoritarian regimes remained in power for a long time in Asian countries and regions which had been invaded by the Japanese military, so the people couldn’t make appeals about war damages from the Japanese military. 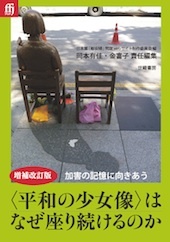 Meanwhile, in Japan, some people were aware of the existence of “comfort women” since the 1970s through a series of books such as “Comfort Women” (1973) by Senda Kako, a documentary film (“A grandmother in Okinawa”) featuring a victim living in Okinawa, Ms. Bae Bong-gi, and a newsletter by the “Asian Women’s Association” called “Asian Women’s Liberation”. Still, it wasn’t regarded as an issue that needed to be dealt with. However, a turning point came in the 1990s. Protesting against the Japanese government’s denial of the military’s involvement in the “comfort women” issue, including statements such as “it was private contractors’ own decision to take [‘comfort women’]” (in June, 1990), Korean women’s organizations, which had led the democratic movement in the 1980s, established the Korean Council for the Women Drafted for Military Sexual Slavery by Japan to resolve the issue in November, 1991. It was Ms. Kim Hak-sun that began to testify under her real name for the first time in South Korea in August, 1991 in response to a call from the council. Ms. Kim came to Japan in December of the same year and filed a suit against the Japanese government in the Tokyo District Court to claim compensation (Asia-Pacific War Korean Victims’ Compensation Claims Case). With this as a turning point, the “comfort women” issue became a social problem in Japan and internationally. After that, women from South Korea (including those living in Japan), the Philippines, Taiwan, North Korea, China, Indonesia, the Netherlands, Malaysia and East Timor came forward and began to testify. Movements and support organizations were established in Japan and other countries to resolve the issue. Meanwhile, in response to reports of the discovery of official documents proving the military’s involvement in the Library of the National Institute for Defense Studies in January, 1992 by a researcher of Japanese history, Yoshimi Yoshiaki, the Japanese government, which had denied the military’s involvement at first, reversed its position and admitted its involvement. 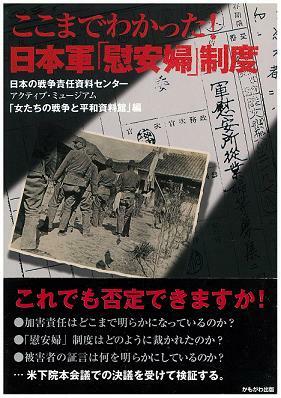 After that, the Japanese government conducted two research investigations on the issue and released the “Kono Statement” in August, 1993, admitting the former Japanese military’s involvement and coercion and expressing its “apologies and remorse”. However, the Japanese government refused to pay compensation (national compensation) to individual victims. Payments made by the “National Fund for Peace in Asia for Women” (1995～2007) were not national compensation but rather “atonement money” that was donated by civilians. Although some victims accepted the payment, many victims refused to accept it, saying that “the purpose of the National Fund is not national compensation” and “the state must pay compensation for crimes committed by the Japanese military, the state organ of Japan”. The international community has also criticized the government, stating for example that the National Fund “does not, however, satisfy the responsibility of the government of Japan to provide official, legal compensation to individual women who were victims of the ‘comfort women’ tragedy” (UN McDougall Report in 1998). In July, 2007, a resolution on “comfort women” adopted by the plenary session of the United States House of Representatives demanded that the Japanese government apologize “in a clear and unequivocal manner” and in December of the same year, a resolution on “comfort women” adopted by the European Parliament recommended that the Japanese government “acknowledge victims’ rights to demand compensation”. Thus the Japanese government’s refusal to pay compensation is not acceptable either to victims or to the international community. How Should the Issue Be Resolved? Then, how should the issue be resolved (For details→Solution 1-5)? First, the Japanese government must clearly acknowledge that the former Japanese military and government forced women to become sexual slaves against their will and it was illegal even in those days (factual findings). Although the “Kono Statement” admitted the military’s involvement and coercion, the facts remain vague as to who was actually responsible for the establishment and operation of the “comfort women” system. This vagueness also seems to have led to a lack of clarity in finding a solution by the National Fund. Both the victims and the international community have clearly stated that the “comfort women” system is “sexual slavery” and that the Japanese military and government is responsible. In order to probe further into the truth of the matter, the disclosure of more materials is needed. Second, the Japanese government must apologize and, as evidence of its sincerity, pay compensation to the victims (apology and compensation). Since the Japanese government has already recognized the issue as “an act, with the involvement of the military authorities of the day, that severely injured the honor and dignity of many women” (“Kono Statement”), what should be done first is to “apologize and pay compensation (national compensation)” to the victims in a clear and unequivocal manner. This can be realized by ①making an apology and admitting state responsibility in an official form such as by Cabinet decision or Diet resolution, ②sending a letter of apology to each one of the victimized women, and ③paying national compensation through legislation. Citizens’ organizations have already proposed legislative solutions. Third, memories of the “comfort women” issue must be passed down through the teaching of history and human rights so that the same mistake will not be repeated (passing down of memories). The Japanese government has already “reiterated our firm determination never to repeat the same mistake by forever engraving such issues in our memories through the study and teaching of history”. Based on this, descriptions of “comfort women” began to be included in junior high school history textbooks starting in 1997. This decision was highly regarded in victimized countries and in the international community. 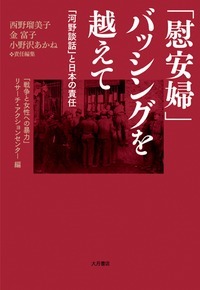 Regrettably, since the late 1990s, historical revisionism denying the “comfort women” issue has arisen in Japanese society, and such descriptions have disappeared from textbooks since 2006. The resolutions discussed above of the plenary sessions of the United States House of Representatives and the European Parliament were adopted out of a concern about the “denial of memories”. In the 2010s, the Japanese government has made active efforts to deny the “comfort women” issue and to review the “Kono Statement”. However, international opinion of not only the victimized countries but also the United States, European countries and Australia strongly warns against reviewing the statement, which would represent “Another Attempt to Deny Japan’s History” (Editorial from the “New York Times”, January 3rd, 2013). Unfortunately, it can be said that internationally, the Japanese government’s consciousness of history and human rights suffers from Galapagos syndrome. The Japanese government and society can gain the trust of the victims, the victimized countries, and the international community only if it takes the above measures in response to the “comfort women” system, which constituted a grave human rights abuse against women. Seriously addressing and overcoming the past could then become the pride of Japan and the Japanese people. ・Center for Research and Documentation on Japan’s War Responsibility and Women’s Active Museum on War and Peace, “It Was Made Clear to This extent! The Japanese Military ‘Comfort Women’ System”, Kamogawashuppan, 2007. 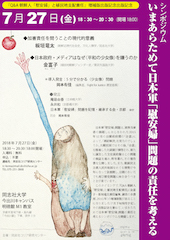 ・“Violence Against Women in War” Research Action Center (VAWW RAC), Nishino Rumiko, Kim Pu-ja and Onozawa Akane (Eds. ), “Beyond the Bashing against ‘comfort women’―‘Kono Statement’ and Japan’s Responsibility”, Otsukishoten, 2013.